Stylish bike gear. An nighttime race. Get thee to Brooklyn. Spring snow or not, the Season of the Bike is nearly upon us. And soon, like the pasty, latte-swilling mole people we are, we’ll scuttle out from the city’s subways to reclaim our streets. Or at least those little green bike lanes. With that in mind, we offer you Gage+DeSoto, which is pretty much the only cycle shop you’ll need this spring. 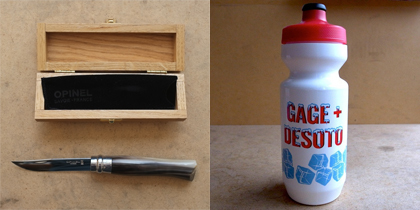 G+D tout themselves as “the intersection of road cycling and design” – like a bike shop for guys who read Monocle. Think limited-edition race jerseys, cheeky water bottles and Euro-style helmets you won’t be embarrassed to wear, plus bric-a-brac like beechwood-handled pocket knives and a library of handsome cycling books (note: It’s Not About the Bike not included). G+D also stocks a range of gear celebrating the annual Red Hook Criterium, a global “unsanctioned race series” kicking off this Saturday night at the Brooklyn Cruise Terminal. Yeah, in the dark. 350+ cyclists – from pros to messengers – weave in and out at 30+ mph around a 1.25 km track chasing cash, glory and the chance to compete in Milan and Barcelona (view the insanity right here). The “Crit” also hosts a 5K footrace which still has a few spots open for registration. You know, if you still need to work up to the biking thing.